Edge of the Center: Steven Stucky comes to June in Buffalo 2012! Steven Stucky comes to June in Buffalo 2012! 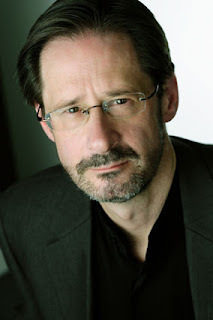 We at the Robert and Carol Morris Center for 21st Century Music are gearing up for June in Buffalo 2012 and are looking forward to having Pulitzer Prize-winning composer Steven Stucky on as a faculty composer. Steven Stucky is remarkably active as a composer and is having his works performed with increasingly dizzying speed. Last February, Stucky’s Silent Spring received both its world and New York premieres by the Pittsburgh Symphony Orchestra, where he currently serves as Composer of the Year, and in the upcoming September, Maestro Gustavo Dudamel will lead the Los Angeles Philharmonic in the world premiere of a recently-commissioned symphony. Later in 2012, Stucky’s Son et lumière will be performed by both the New York Philharmonic and the Pittsburgh Symphony Orchestra, conducted by Alan Gilbert and Leonard Slatkin respectively. We are very excited to have Steven in town for a week of master classes, lectures, workshops, and concerts, which will culminate on Sunday, June 10th, with a performance of his Jeu de timbres by the Buffalo Philharmonic Orchestra, conducted by JoAnn Falletta. For over 20 years, Stucky enjoyed the longest relationship on record between a composer and an American orchestra: in 1988 André Previn appointed him Composer-in-Residence of the Los Angeles Philharmonic. Later, as the ensemble’s Consulting Composer for New Music, he worked closely with Music Director Esa-Pekka Salonen on contemporary programming, the awarding of commissions, and programming for nontraditional audiences. He founded the orchestra’s Composer Fellowship Program for high-school-aged composers. He also hosted the New York Philharmonic’s acclaimed “Hear & Now” pre-concert programs for several seasons, introducing important works and premieres to Philharmonic audiences. His other residencies include the American Academy in Rome; Princeton University’s Composition Colloquium; James Madison University; University of South Carolina; University of Illinois at Urbana-Champaign; Eastman School of Music; and Grinnell College in the US. Internationally, they include the Pontificia Universidad Javeriana in Bogotá, Colombia; the Swedish Collegium of Advanced Studies; the Central Conservatory of Music, Beijing; the Shanghai Conservatory; and the Taipei National University of the Arts. In March of 2012, Stucky will take up a residency at the Cleveland Institute of Music, and in the 2012-13 season, he will be the Music Alive Resident Composer at the Berkeley Symphony Orchestra. He has also written commissioned works for many of the other major American orchestras, including those of Baltimore, Chicago, Cincinnati, Dallas, Florida West Coast (Sarasota), Minnesota, Philadelphia, St. Louis, St. Paul, and Washington (National); as well as for Chanticleer, the Boston Musica Viva, the Camerata Bern, the Raschèr Quartet, the Koussevitzky Foundation, the Barlow Endowment, the Howard Hanson Institute of American Music, Carnegie Hall, the BBC, the Aspen Music Festival, the Singapore Symphony, the Percussive Arts Society; and for such celebrated solo artists as pianist Emanuel Ax, recorder soloist Michala Petri, guitarist Manuel Barrueco, baritone Sanford Sylvan, percussionist Evelyn Glennie, and cellist Elinor Frey. Check out the video below of the LA Piano Quartet offering a gorgeous interpretation of Steven Stucky’s Piano Quartet. Welcome Julia Wolfe to June in Buffalo 2012! June in Buffalo 2012 Concert Schedule Announced! June in Buffalo 2012 participants announced!